Katz And Other Tales: Let The Games Begin! all the best to you!! may the best cat win!! yay!! I just have to comment on that TUMMY! How snorgleable. Delicious. Lovable. These are great entries! Good luck! Errr...unfortunately, none of us are athletes.... Brad was, but he's sick. purrr...meow! Thanks for visiting Basil's blog, he thinks you are VIP Kitties! Bravo! Your entries are golden!!! What fun photos!! I especially love the yawn and synchronised snoozing! Definitely gold medal performance :-) We are participating to some of the competitions, too. Can't wait to see all the entries! LOL! They're all winners - although I do have a soft spot for that synchronised snoozers shot! thanks for telling us about this, we'll go practice now. Maybe I join the Games some day when mum is prepared to send a contribution or whatever it is called! You kids have those medals all sewn up! Mr. G and I laughed our heads off ! 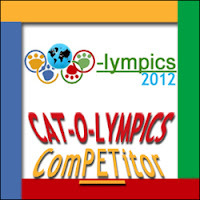 What an excellent idea with "Cat Olympics" hahaha ! We probably shouldn't say anything, but you two are gonna win...we just KNOW it!!! Excellent athletes you are!! 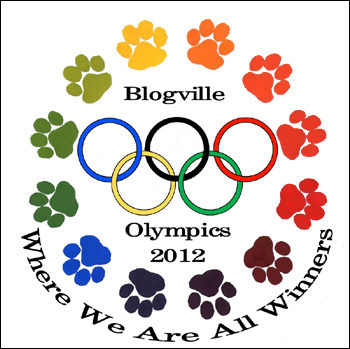 You ginger kitties are sure going to win some gold medals for sure. Thanks for all the info. We need to get busy getting entered. Hope you have a great week. We love all your cat olympic entries but the synchronised snoozing must be a sure winner. Creative! Your yawning shot is a solid 10! I'm sure you don't need Ojizousama. You have great companions. You are masters of sports, awesome performance and I love your pictures! Love this! They are winners to me in each event! So cute! Oh Wow! What great competitors yous is! Is yous going to enter the high jump? Strength and litheness wins! Purrs! Now that looks like some fierce competition! woo woo woo! 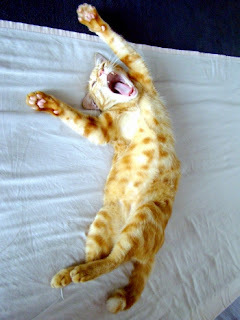 Oh, I just love your cats and your posts make me smile every time! Can't beat Target's nippy face.